While there are no scientific documentation or evidence on allergies to dental implants, some patients have expressed atypical symptoms following their placement. These atypical symptoms range from non-specific pain to general malaise, to headaches, and others. While medical evaluation and diagnostics may show no abnormalities, patients continue to have these symptoms and wonder if in some way they may be related to their dental implants. We reported on a patient who had been experiencing atypical pain in the area of his upper implants for 3 years since their placement. Following extensive medical evaluation he was found positive for Nickel allergy. The implants, although Titanium primarily, were disclosed by the implant company to have traces of Nickel. The evaluation showed no evidence of inflammation or infection around the implants. Cone beam CT scan showed minimal or no bone around one of the implants, but otherwise within normal. Although a clear relationship between the implants and patient’s symptoms could not be established, with no other options, patient decided to proceed with removal of the implants in hope for being symptom-free. 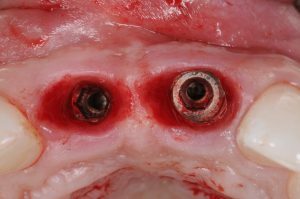 Removal of dental implants can be done within a few minutes with a minimally-invasive approach using reverse torque techniques. Therefore, we are not compromising the supporting bone and gum tissue by the procedure. The question remains does the implant removal resolve such symptoms? Will patients symptoms improve? In absence of clear inflammation or infection (peri-implantitis) it is difficult to make such correlations and guarantee improvement. However, we do need to allow the possibility for some type of a reaction as the contributing factor to such atypical symptoms. Unfortunately, the results of implant removal in such circumstances can not be predicted and will not be known till after the procedure. With loss of investment in the initial therapy, additional cost in their removal, and having to go through another procedure, it is certainly a difficult decision. The video below shows the treatment strategy for this reported patient. We will monitor his progress closely and report it soon. This entry was posted in Dental Implants and tagged allergy to dental implants, dental implant removal, explantation. Bookmark the permalink. ← When to Consider Bone Graft for Impacted Wisdom Teeth?